A unique piece of equipment, the LoadAll saves space, time and energy in every application. 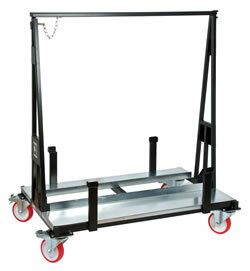 It is a unique tool, designed for storing and transporting plasterboard and other large sheets of materials, and is the first on the UK market which can be folded down and stacked when not in use. The LoadAll has been specifically designed with a centre A-frame; this means that when it is loaded with plasterboard, all the weight is leaning into the centre, which makes it a great deal sturdier than the traditional design. It is fast and simple to erect and can be up and running in as little as 13 seconds! 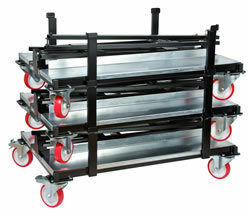 The unique design of this unit, combined with the heavy-duty 6 inch castors, makes it nearly impossible to overturn. Even though this is a folding unit, there are no detachable parts. This prevents anything from being lost and will save money and time. This unit has been weight load tested to carry up to one tonne, and a certificate of conformity can be provided, to prove the Safe Working Load (SWL). 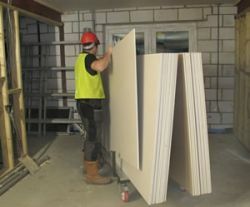 The Armorgard LoadAll can carry up to 24 sheets of plasterboard, in comparison to other alternatives on the market, which only carry an average of 15 sheets. This means that the Armorgard LoadAll can carry up to 60% more plasterboard, than other alternative products. A lot of time has been spent to make sure this works best for the user of the product. Please give us a call on 023 9238 0280, to discuss how you can sell this item to your customers.